Since ROAR has added this new great class to it's line up, I thought I would start a new thread about it and keep everyone updated on the Electric Pro Truck races in the ECNS also. Is there any track in Virginia or Maryland running this class? I'd love to race against some local guys. Great day for racing and a hard fought "B" main with Timothy Habiuk and Karl Kobernus getting the 2 bump up spots to fill the 12 truck "A" main that Dereck Martin's Novak GTB 5.5 powered T-4 earned the top TQ spot. Dereck Martin took the lead on lap 6 leaving a fierce battle between Doug Tudor and Dennis Allison that was not decided until the final lap with Dereck Martin taking the win, Doug Tudor 2nd and Dennis Allison finishing 3rd! Congratulations to all the Pro Truck Racer that attended and now with ROAR adding our class it looks like it is going to get big nationwide! 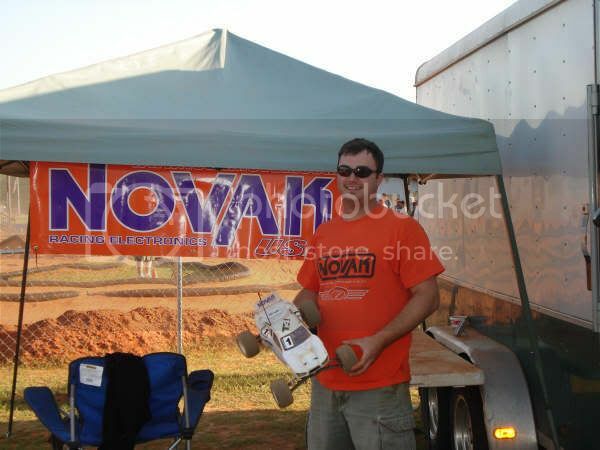 Novak GTBs with 5.5 brushless motors dominated the top 3 spots! 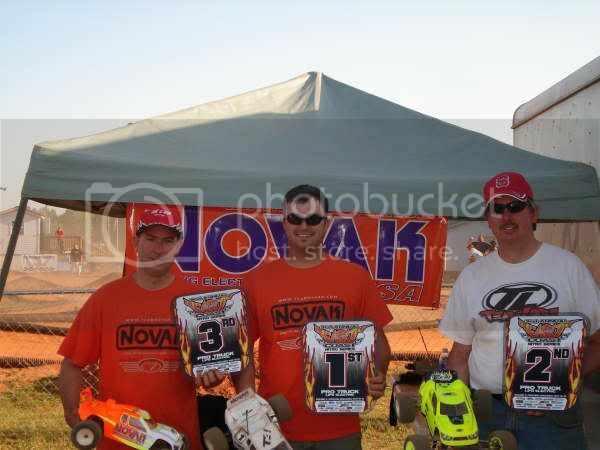 See everybody at Rodslingers Raceway in Griffin, GA on June 2nd for Round 4 of the ECNS! Summer Nitrofest is at the Farm Raceway on June 8th thru 10th and the ROAR Off-Road Electric Nationals are in Albuquerque, NM on June 14th thru 18th! The ECNS round 5 race is at the Tiltyard Raceway in Dayton, VA on July 14th with the Pro trucks visiting there. Sounds Great! I've been meaning to check out homer's track, and making the trip that weekend will serve two purposes! Thanks for the heads up. I'll watch the link and register when its available. Looks like Roar is opening the door for BL/Li-Po Pro Truck racing. That is great. I am glad this type of class is growing and being a demo class at the Roar Off Road Electric Nats. I would say ride with me, but I don't think you want to stay away from home for 2 weeks in a big truck. The t4 and the mf2 both work great. The novak gtb 5.5 seems to be the most popular motor thus far. Any 8k mah 7.4 volt battery with at least a 10c rating will work for a battery. The charger of choice is the astroflight 109. The cheapest packs that work well are probly truerc.com 8k mah 10c 7.4 volt packs. Thanks for your answers. Always nice to know what others are riding. I have always just skimmed the side of the battery slot when ever I needed to make a little more room. Yes, I did try and fit the Truc RC 8000 Li-Po into my MF1 and it does not fit. My battery box is fairly shaved down on both sides and it still wouldn't fit. I was hoping to give these cells a try. My servo is a Futaba 9451. I will be adding some weight to my truck too to see if it can make it any better.